Some are saying Garfield is gender-neutral. Garfield was a boy... until now. We all know Garfield the Cat. The orange-furred, always-hungry, lasagne-loving cartoon feline of puns and sassiness created by author Jim Davis. Since Garfield's first publication in an American comic strip back in 1978, fans of the cat have never really discussed the finer details of the character -- such as his gender, with readers always presuming he was a male. But in 2017, things aren't so simple. American online satirist and podcast host Virgil Texas has started an online furore around the gender of Garfield after he publicly announced the cat is "gender-neutral", before updating the character's Wikipedia page and changing the listed gender. In response, long-time fans of the cartoon erupted with their support for Garfield as a male, ultimately ending in a long-running Wikipedia page-editing battle to define the gender that is listed online. Citing his evidence as coming from the "Garfield Canon", Texas' claims were sparked by comments made by Davis in a Mental Floss article in 2014 that suggests the cat could be genderless. 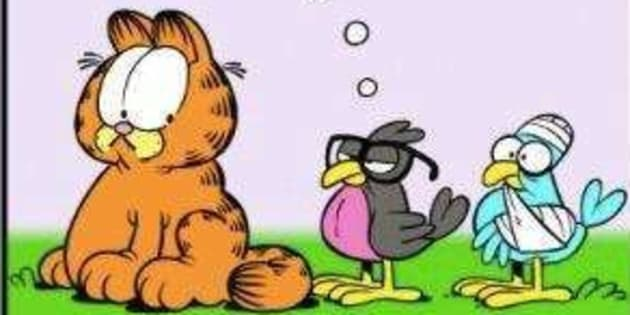 "Dealing with eating and sleeping, being a cat, Garfield is very universal. By virtue of being a cat, really, he's not really male or female or any particular race or nationality, young or old," Davis said. And before you knew it a 60-hour Wikipedia war had begun, with the online encyclopedia having to lock down Garfield's webpage due to the high number of edits being made to his gender, according to the Washington Post. "Gender is fluid. He may have been a boy in 1981, but he's not now. Do better," one Wikipedia user said on the edit history log of Garfield's page. "Fixed the gender; fellow characters referring to G as male don't outweigh the creator saying he isn't. They could be mistaken, after all," another entry reads. Followers of the cartoon series have also been reacting strongly with their beliefs that Garfield is a boy, pushing the use of male pronouns in the original comic version of Garfield and also his male-sounding voice in the 2004 and 2006 film renditions, where he was voiced by Bill Murray. ...though the current Garfield CGI cartoons gave him a deeper voice. And then, of course, there are those who simply don't understand why this has become such a big issue. Y'all need to stop trying to turn the world upside down. Garfield the Cat is a male. Period. @virgiltexas I'm shocked. Not that Garfield is male but that this became such a big deal to anyone.